Apple has updated iOS, macOS, and tvOS to fix some usability quirks and address bugs. As always, it’s a good idea to wait a few days before updating to make sure there aren’t any major issues. The best thing about iOS 12.1.1 is that it brings back the single tap to flip between the front- and rear-facing cameras during a FaceTime call. In iOS 12, Apple inexplicably buried that button behind another panel, which was frustrating. You can also once again capture Live Photos in FaceTime calls, a feature that had been present prior to iOS 12.0. Note that you can capture Live Photos only in one-on-one FaceTime calls, not in group calls. 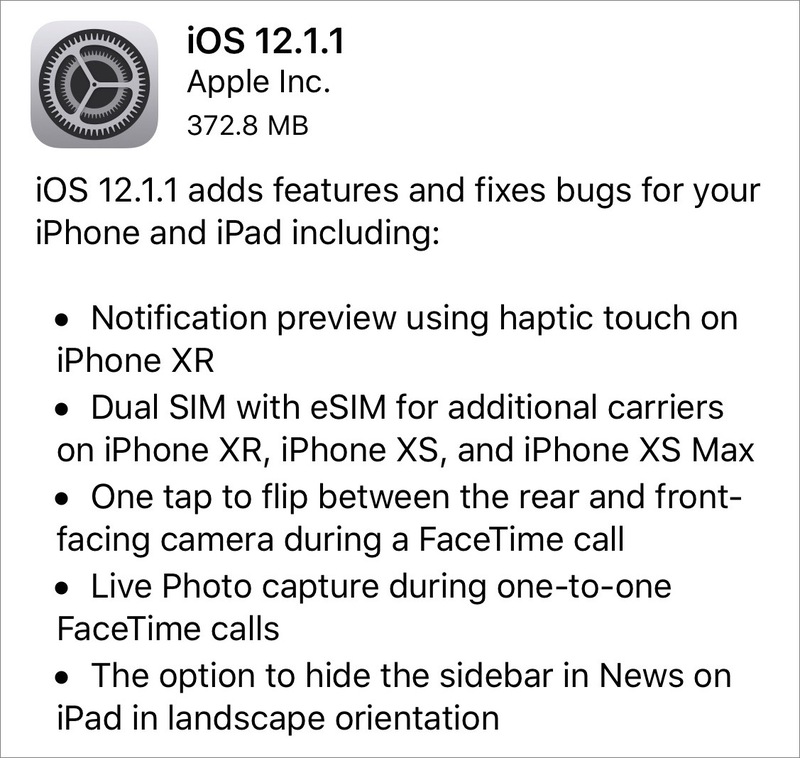 iPhone XR users will be pleased to know that iOS 12.1.1 lets you use haptic touch to preview notifications. We can’t help but wonder if increased support for haptic touch bodes ill for the future of 3D Touch. The iOS 12.1.1 update also expands carrier support for the dual SIM feature of the iPhone XS and XR, though Apple doesn’t specify which carriers now support it. The iOS 12.1.1 update is 292.3 MB on the 10.5-inch iPad Pro and 372.8 MB on the iPhone X, and you can obtain it in Settings > General > Software Update or install it through iTunes. The macOS 10.14.2 Mojave update brings real-time text support for Wi-Fi calling, adds a menu item to News for opening a story in Safari (File > Open in Safari), and resolves a bug that prevented iTunes from playing media to third-party AirPlay speakers. It also includes 12 security fixes. You can install the 2.47 GB update in the new Software Update pane of System Preferences. The tvOS 12.1.1 update includes “general performance and stability improvements.” Did you expect something else? Well, there are also 11 security fixes. If automatic updates aren’t on, you can update your fourth-generation Apple TV or Apple TV 4K by going to Settings > System > Software Updates. 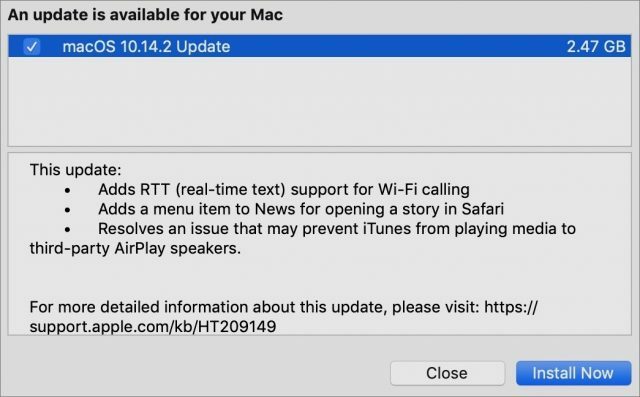 Along with that update Apple released a security update for HS along with a Safari update. Any idea if those are kosher? I’m waiting to install on my main work Mac. I tried the update on an old 2010 15" MBP I have at work and there although the update appeared to complete, after rebooting twice it got stuck in a loop where it would boot to only show log files and offer to either restart or shut down. It claimed the update hadn’t completed. It took me a while to figure out that I could only get it to fully start up if I tried a safe boot. That got me into Finder where I was able to launch the MAS and see that it was still offering the update. Selected to install it again and that time it ran through all the way. Rebooted twice. Second time it got me all the way to Finder. Never seen such behavior before. No problems with the HS update here and I won’t get around to Sierra until the weekend. Actually short and sweet as updates go, but did include a firmware update for selected platforms which explains the second boot you experienced. Not sure what the first experience was all about, but I have heard similar unexplained reports in the past.